HD video: on my own domain, archive.org, blip.tv, Vimeo or Youtube? There’s so much video content available on the web today, with many different styles for sharing. The variety of considerations can lead one person to favour an approach that isn’t quite right for someone else. After months of trial-and-error, I’ve compiled a comparison of web movies hosted on (1) my own domain, (2) Community Video on archive.org, (3) blip.tv, (4) Vimeo, and (5) Youtube. 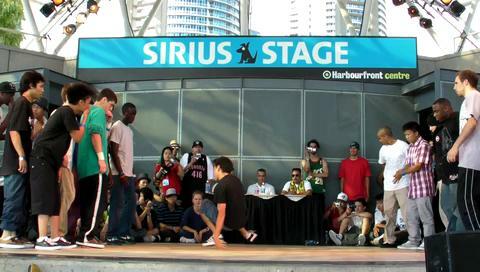 I was motivated to share the experience of the Beat, Breaks & Culture festival at Harbourfront Centre in Toronto on July 11, in which my third son Noah performed in the final battle between Ground Illusionz and The F.A.M. (a) Website blocking / Internet filtering? Is web site blocking (more formally known as Internet filtering) by national governments (e.g. by China and other countries); in public libraries (e.g. content judged offensive or inappropriate); or in workplaces (e.g non-work-related use) a concern? (b) Media containers? The H.264 (MPEG-4) standard is emerging as a new leader, with Flash Video common as a plugin to most browsers but not supported on Apple products. Digital cameras may produce AVI, MOV (Quicktime) or other formats, while different browsers natively support Theora (Ogg Video) and WebM. (c) Browser embedding and linking? Once the web movie is on the Internet, how easy is embedding into a blog post, and/or creating a web link? (d) Streaming and downloadable? Is it possible to both watch the video online in a browser, and download it onto a mobile device for later replay? (e) Input formats and transcoding? What video formats are accepted on web sites, and/or is transcoding conversion required before uploading? (f) Uploading (and transcoding) Is content uploaded through a browser or fat client, and is online transcoding an option? (g) Streaming performance? Since video files are large, how do they look when streamed on the Internet? (h) Copyright? Does the web provider have legal constraints or guidance? (i) Cost Will an outlay of money be required (or desirable, if effort can be reduced)? We’re on the edge of a emerging standard that is well described in the Dive into HTML5 online book. We may be approaching an era where we can share movies and not have to worry (too much) about obsolescence. Let’s look at each of the alternatives. Streaming media is better controlled by servers running RTSP (Real Time Streaming Protocol) rather than the HTTP (Hypertext Transfer Protocol) designed for web pages mostly of text. Under HTTP, however, pseudo-streaming has recently become an option within the reach of do-it-yourself types. Watch the larger 720x400px video or the original size 1280x720px video hosted on coevolving.com. This pseudo-streaming takes advantage of the open source VideoJS script, either on manually-coded HTML5 pages or with WordPress plugin scripts. VideoJS builds on the Video For Everybody code that determines an appropriate video format for the player in the browser. (a) Website blocking / Internet filtering? An independent web domain name and IP-based virtual hosting (e.g. a dedicated IP address on site5.com) precludes being associated with appropriate blacklistings. (b) Media containers? Up to you, with H.264 (MP4) pseudostreaming and FLV playable by Flowplayer and by JW Player. (c) Browser embedding and linking? The Video For Everybody code in the the VideoJS plugins (for WordPress, for Drupal, etc.) or static HTML5 page selects the native media player for the browser at hand. (d) Streaming and downloadable? VideoJS pseudo-streaming can be embedded into blogs with shortcodes. Files are downloadable when browser selection fails, or by explicitly coded web links. (h) Copyright? Whatever you designate on your web site (e.g. Creative Commons or full copyright). The major motivation for hosting video content on my own domain is to avoid the major web video servers blocked by the Chinese government, as well as by some schools and by some workplace employers. Since I already manage a number of web domains and have a dedicated IP address, the independent domain is less likely to be associated with appropriate blacklisting, and some remediation options will be possible if blocking does occur. Smaller videos (e.g. 480x272px and 720x400px) stream well, but full HD content (i.e. 1280x720px) will more practically have to be downloaded for playing. Managing my own content, I’ve followed the detailed instructions of the Dive Into HTML5 “Video on the Web” article to transcode movie content (with Handbrake, Firefogg, and WinFF), and transfer the files onto directories of my web site. I prefer open source software to purchasing utilities, although there’s a learning curve that takes time. The Internet Archive — a not-for-profit organization known for backing up the whole Internet with “The Wayback Machine” — provides free hosting of web movies in the Community Video section at archive.org. The multiple video formats are listed on a single page at archive.org . While the function of archive.org is primarily to distribute content (i.e. uploading and downloading), using the VideoJS code enables streaming similar to that described with self-hosting. (a) Website blocking / Internet filtering? Web domain is blocked in China. (b) Media containers? Prefers downloadable media for future editing, so MPEG2 is permitted, with MPEG4, Ogg Video common. (d) Streaming and downloadable? Presumes downloadable files, can pseudo-stream using VideoJS embedding in blogs with shortcode. (h) Copyright? In the spirit of sharing, a Creative Commons licensing is preferred. Archive.org, unfortunately, is one of the websites inaccessible from China. The transcoding and uploading procedures are much the same as for self-hosting, so there merits and demerits of the Internet Archive rest with whether you subscribe or don’t subscribe to their philosophy. Blip.tv is a New-York based startup that takes care of many of the video format and distribution tasks associated with sharing web video. This episode appears in various format at on blip.tv , and I have my own show page. (b) Media containers? Prefers H.264 M4V, accepts FLV. (c) Browser embedding and linking? The blip.tv player is customizable, providing embed codes for other web sites. First to support HTML5 as an experimental option. (e) Input formats and transcoding? Accepts master (to be transcoded), web (FLV and FLV HD), portable (iPod, PSP, Zune), television (AppleTv, Media Center) formats and will transcode to M4V (although my test transcodes have been unsuccessful). (f) Uploading (and transcoding) Browser uploader, with option to use “classic” uploader (that doesn’t use Flash). (g) Streaming performance? Starts with 480×300 FLV player, with drop-down box to select alternate formats (e.g. mp4, m4v, flv). (i) Cost Episodes are limited to 1GB. Basic accounts get lower priority for online transcoding (which didn’t succeed for me in tests). Pro accounts get online transcoding to support iPod, and the ability to re-request online transcoding. Blip.tv takes care many of the concerns about evolving web standards. If you can upload H.264 MP4 video, it should be viewable on web browsers. Online transcoding is a feature, but it failed on my tests so that I transcoded offline and then uploaded the files. In addition to providing the choice of which video format version to watch, the source files are available for download and tracking with feeds. Unfortunately, blip.tv is a domain not accessible in China. Vimeo is a New York-based division of IAC/Interactive that seems to be popular for sharing amongst friends and family. This video is available on Vimeo , and I have a page for my collection. (a) Website blocking / Internet filtering? Web domain is blocked in China, maybe blocked in schools. (b) Media containers? The Vimeo Universal Player (Moogaloop) streams FLV, with HTML5 now in beta. (c) Browser embedding and linking? Links to embed video on other web sites are provided. The embed code invokes the Universal Player for desktops, iPhone, iPod, etc. (d) Streaming and downloadable? Uploads are converted to Vimeo format; Vimeo Plus accounts preserve source files for download. (f) Uploading (and transcoding) Upload via browser, or use Vimeo Desktop Uploader. (g) Streaming performance? Starts with 525x295px FLV player, with buttons to select HD version and show in full screen. (h) Copyright? Only permitted to upload content created in person, encouraging Creative Commons licensing. (i) Cost Basic accounts receive 500MB per week of upload space, 1 HD video per week, up to 10 videos per day; Vimeo Plus increases to 5GB per week (1GB per file), and removes advertising. Vimeo was accessible in China in September, but then became blocked a month later. Its popularity may be resulting in more filtering in schools (and workplaces). The Universal Player takes care of video transcoding concerns with Flash, but HTML5 support is now in beta. The web site is oriented towards streaming, with movie downloading a feature of Vimeo Plus. Youtube is the market leader in sharing videos on the web. It was acquired by Google in 2006. The page at Youtube has a sidebar of suggestions of alternatives that may be of interest. I have my own Youtube channel, that includes videos of others that I’ve queued for watching. (d) Streaming and downloadable? Primarily a streaming service that allows originator to download own content. Partners can enable downloading of some content. (f) Uploading (and transcoding) Browser upload button at the top of every YouTube page. (g) Streaming performance? Starts in 480p FLV in 640x390px pane, with 240p and 360p options. (I haven’t tested the 720p HD option, as the original file was longer than 10 minutes). (i) Cost Free, with video limit less than 15 minutes, smaller than 2GB in size. Individuals and companies may be invited to become Youtube Partners to enable revenue sharing and permit uploading longer/bigger files. The most recognized domain name in video sharing is a prominent target for blocking. Google is driving many web standards, so HTML5 (not to mention WebM) are currently in beta. Youtube does not see itself as a downloadable distribution channel, and orients almost exclusively for online web streaming. The limit to videos of 15 minutes maximum discourages the playing of huge files. 6. How should I share my video? I’ve enjoyed still photography and audio recording since my high school days, and easily made the transition to digital photography and digital audio recording. Aside from a primary school project using 8mm film, however, I have generally avoided dealing with motion pictures because they’re way more complicated. On the web, technologies are still shifting. The Flash video that is so common on Youtube won’t play on an iPad, as part of a policy decision at Apple. Further, the XHTML specification for web browsers is giving way to HTML5 video, but a full standard has not yet been adopted by all parties. This is complicated by licensing of H.264 MPEG-4 protected by patents, Theora Ogg video as open source, and WebM espousing improved performance. Here’s an aggregate view of all of the considerations described above, point by point. (d) Streaming and downloadable? VideoJS pseudostreaming can be embedded into blogs with shortcodes. Files are downloadable when browser selection fails, or by explicitly coded web links. Presumes downloadable files, can pseudostream using VideoJS embedding into blogs with shortcode Includes “Files and links” direct access to source files, as well as RSS feeds Uploads are converted to Vimeo format; Vimeo Plus accounts preserve source files for download. Primarily a streaming service that allows originator to download own content. Partners can enable downloading of some content. (f) Uploading (and transcoding) Upload to web host via FTP (e.g. with Filezilla), online transcoding not available Upload to archive.org using HTTP uploader, and they may attempt to transcode (which I haven’t tested) Browser uploader, with option to use “classic” uploader (that doesn’t use Flash). Upload via browser, or use Vimeo Desktop Uploader. Browser upload button at the top of every YouTube page. (g) Streaming performance? On a hosted Apache server, 480x272px streams well, 720x400px quality depends on connection, 1280x720px may be challenged From archive.org, 480x272px streams well, 720x400px quality depends on connection, 1280x720px may be challenged Starts with 480×300 FLV player, with drop-down box to select alternate formats (e.g. mp4, m4v, flv). Starts with 525x295px FLV player, with buttons to select HD version and show in full screen. Starts in 480p FLV in 640x390px pane, with 240p and 360p options. (I haven’t tested the 720p HD option, as the original file was longer than 10 minutes). (i) Cost Practically only web hosting charges, with software available as open source Practically free, as web space on Community Video on archive.org is free, and web space for blogs and HTML pages is often ad-supported Episodes are limited to 1GB. Basic accounts get lower priority online transcoding (which didn’t succeed for me in tests). Pro accounts get online transcoding to support iPod, and the ability to re-request online transcoding. Basic accounts receive 500MB per week of upload space, 1 HD video per week, up to 10 videos per day; Vimeo Plus increases to 5GB per week (1GB per file), and removes advertising. Free, with video limit less than 15 minutes, smaller than 2GB in size. Individuals and companies may be invited to become Youtube Partners to enable revenue sharing and permit uploading longer/bigger files. The casual users are likely to be attracted to Youtube for its popularity. Vimeo may appeal to community and family users looking for upgradability. Professional users should like blip.tv for its broader distribution features. Institutions may be more assured with the potential longevity of the Internet Archive, while do-it-yourself types can pseudo-stream small videos on their own domains. There is the possibility of uploading content to multiple places, with the ensuing complications. The rise of video sharing in participatory media means that the audience under 30 years of age is watching content less on television and more on the Internet. The price of digital video recording continues to fall. Most people will look for an easy route from camera to web, but the choices can be even more complicated than for digital photography. On my iPod Touch 3, this web page through the Safari browser: VideoJS (both from my own domain and from archive.org) shows and plays correctly; Youtube shows and plays correctly; blip.tv and Vimeo shows package icons rather than the posters to the videos. Through Opera Mini, VideoJS shows the downloadable links only, and the posters to blip.tv, Vimeo and Youtube completely disappear. On my Blackberry Bold 9700, this web page through both the Blackberry browser and Opera Mini: VideoJS shows the downloadable links, and the posters to blip.tv, Vimeo and Youtube completely disappear.